What is the Healthy Indian Diet? The Healthy Indian Diet is a traditional pattern of nutrition-rich foods inspired by the cuisines of South Asia. This isn't a crash diet, but a lifelong guide on what to eat to stay well and prevent chronic disease. Thus, it's similar to the Mediterranean Diet. You probably know the Mediterranean Diet is good for you. Pioneers in nutrition research observed how a great number of Italians and Greeks who were eating their local traditional diets had low rates of heart disease, a finding later confirmed by more rigorous scientific studies. I began to wonder: Can the Mediterranean Diet be the only traditional combinations of foods that's good for people? My conclusion is no, actually. By reviewing the scientific literature over several months, I came to understand that elements of traditional Indian diets can be healthy too. In fact many well-trained experts have come to the same conclusion. Dr. David Servan-Schrieber, author of the #1 New York Times bestseller "AntiCancer" and himself a cancer survivor, explains that the Indian diet can help prevent cancer. Dr. Dean Ornish, who showed how people can reverse coronary heart disease by lifestyle changes, describes how Indian dishes made in the traditional manner can be heart-healthy, being mostly plants. Dr. Oz explains that Indians have a low rate of Alzheimer's dementia because they use turmeric powder in everyday cooking. of the Healthy Indian Diet are! But before you rush to your local Indian restaurant, know this: The modern Indian diet is bad. In fact, modern versions of all traditional cuisines lack nutrients and put harmful things into your body. 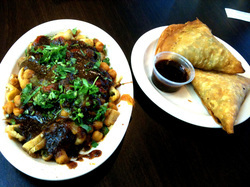 The higher amounts of fried foods, refined grains, white and corn sugars, starches and other easily digested carbohydrates in today's food, combined with lesser amounts of natural foods carrying good fats, phytonutrients, antioxidants, vitamins, minerals and fiber, explain in large part why Americans as well as South Asians in the West have high rates of heart disease and diabetes and why these rates are rising all over the world. Did you know the link between modern diets and chronic diseases was made a long time ago? It's true, it was first described by medical doctors working in colonial India. (Read about Dr. Robert McCarrison, who made his discoveries in turn-of-the-century India and blamed the swift rise in chronic disease in the U.S. and U.K. on carb-rich, nutrition-poor diets.) These pioneers documented how villagers enjoyed good health for generations on their traditional diets until they began eating white rice, finely-refined wheat, and processed foods. Traditional Indian diets on the other hand emphasized whole grains, lots of plants, fermented dairy, and spices, and created a strong foundation for good health. In the book "The Healthy Indian Diet," you'll learn about how chronic diseases affecting millions of people in the America, the U.K., India, and throughout the world today are linked to modern diets we eat all the time. You'll also discover the elements of traditional Indian food that are good for you and help prevent chronic disease. 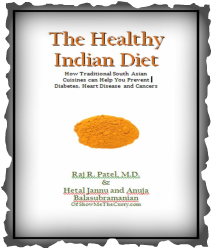 "The Healthy Indian Diet" also contains recipes to help you get the hang of what ingredients and dishes are healthy and how to cook healthier Indian food. Fortunately for us what's good for the body also tastes good, thanks to the wonderful array of flavors endowed by Nature and the creative cooking genius of Anuja and Hetal of ShowMeTheCurry.com.